Birthday dreams will surely come true with this delectable strawberry cake! 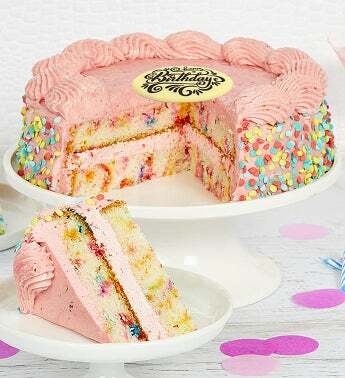 A scrumptious blend of strawberry filling and frosting is sandwiched between two layers of yummy confetti cake and then the cake is finished off with more strawberry frosting & confetti sprinkles on the side. Includes a White Chocolate Happy Birthday plaque and arrives in an elegant gift box. 7” Strawberry Funfetti Birthday Cake, net wt. 1.75 lbs.